Pallet Racks are a great way to store Drums, Barrels and other equipment that hold liquid contents. A racking system gives storage areas the ability to store vertically as well as horizontally. However, small leaks and spills from palletized contents often occur under and around the storage areas and industrial facilities are increasingly required by state, federal and local regulations to have spill prevention and containment measures in place to remain in compliance. These regulations require facilities to build structures and institute plans of action to prevent spills from occurring. In the event of a spill a secondary containment system would prevent potential spills from advancing into employee work areas and creating a hazardous work environment. • Loading and off-loading areas including the dock area and locations having spigots, hose connections, etc. There are many reasons for and benefits from using secondary spill containment systems with your pallet racking. You offer your employees a safer work area, you reduce your liability risk, a spill containment system saves you money on clean up and keeps you in compliance with regulatory agencies to name a few. Even if your company is not required to have a secondary containment system it is a safety precaution that cannot be ignored. 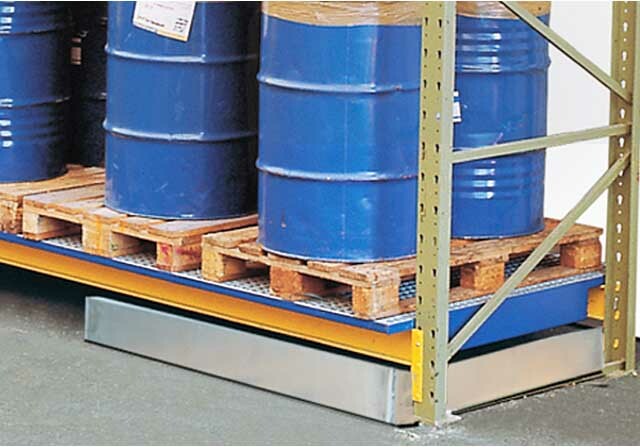 View the Pallet Rack Drip Pan section here.